NVS 2.5 h42-unique optiko-elektronny night vision device that does not have analogs in the world and a new focus in the optical instrument. It first sold the idea of simultaneous visual and acoustic monitoring of the facility, located at a considerable distance from the observer, in the face of a natural night light. 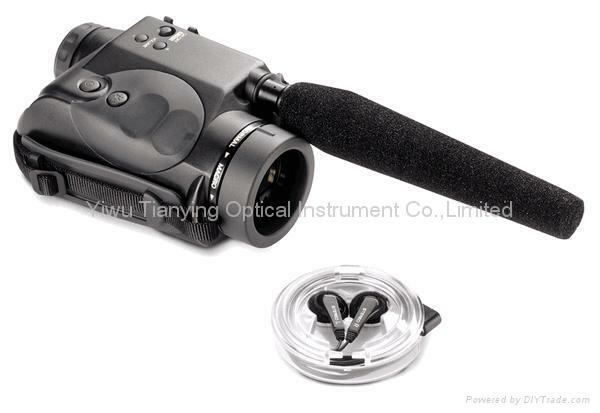 Night vision goggles convenient and easy to use. In monokulyare night vision NVS 2.5 h42 using small optical scheme based on zero EOPah generation. Thanks to optimally calculated multiple (2.5 x) lights and night vision device provides high quality images. fotoadaptera allows for the existence of photographic and video in night conditions. Powerful IK-osvetitel provides an opportunity to observe in complete darkness. Using a microphone can be designed to carry out various listening to the sounds up to 100 m. The existence of the output plug allows for recording audio signals. Night vision goggles reliably protected obrezinennym shell packed in a cloth cover udaroprochny Cardura and foamed polyurethane.